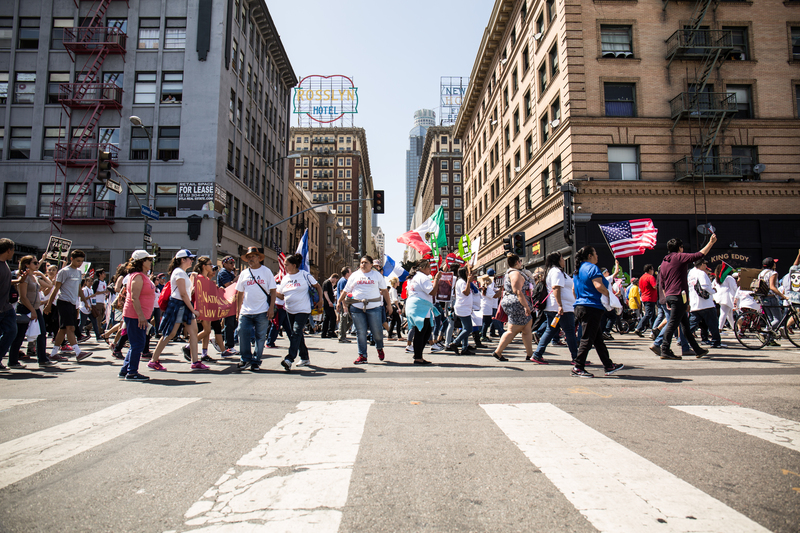 Yesterday I went to Downtown LA near 11th and Figueroa street to take pictures of the May Day or International Workers’ Day march. 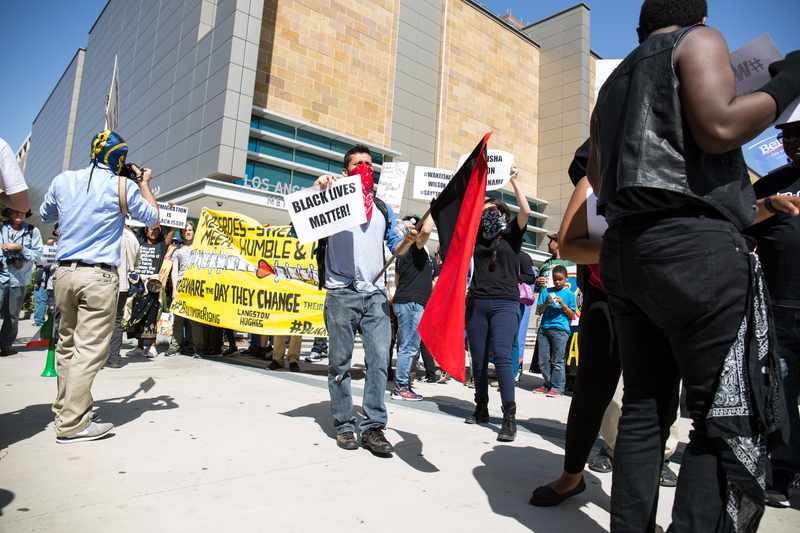 This event was put together by the May Day Coalition of Los Angeles. 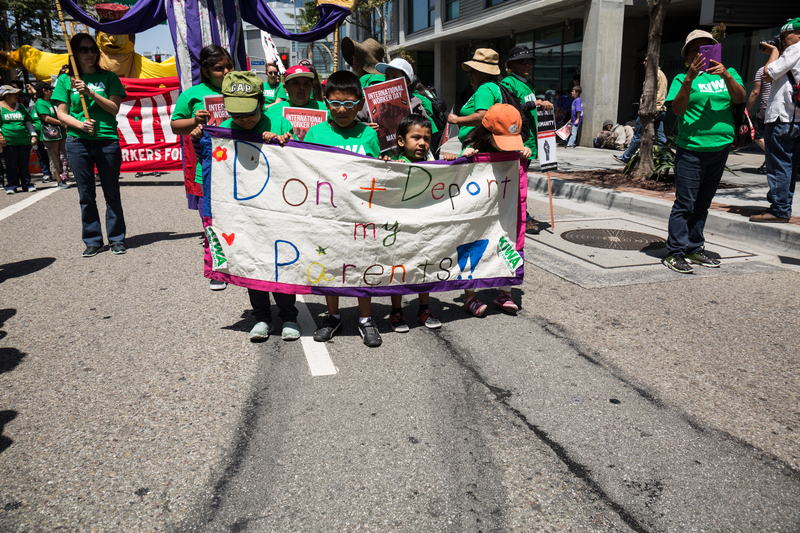 Here are some of the pictures and I will have a video of the march finished in the next couple of days. 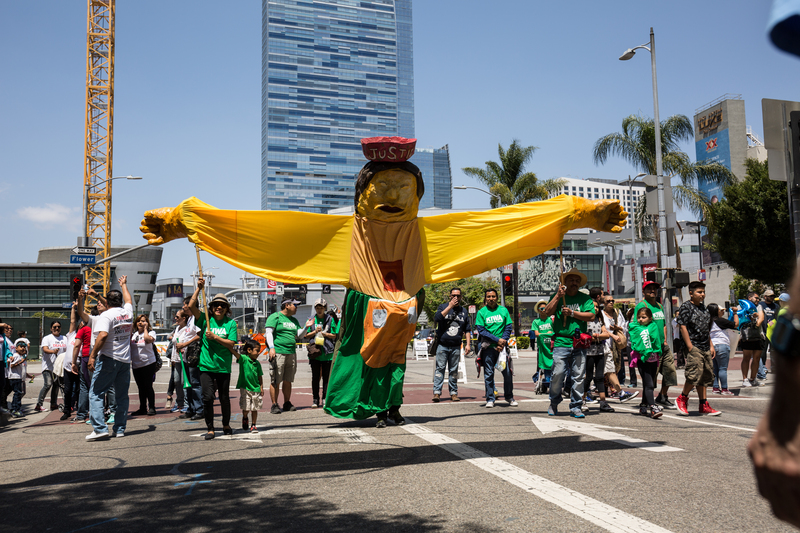 Koreatown Immigrant Workers Alliance (KIWA) march with giant puppets for International Workers” Day. 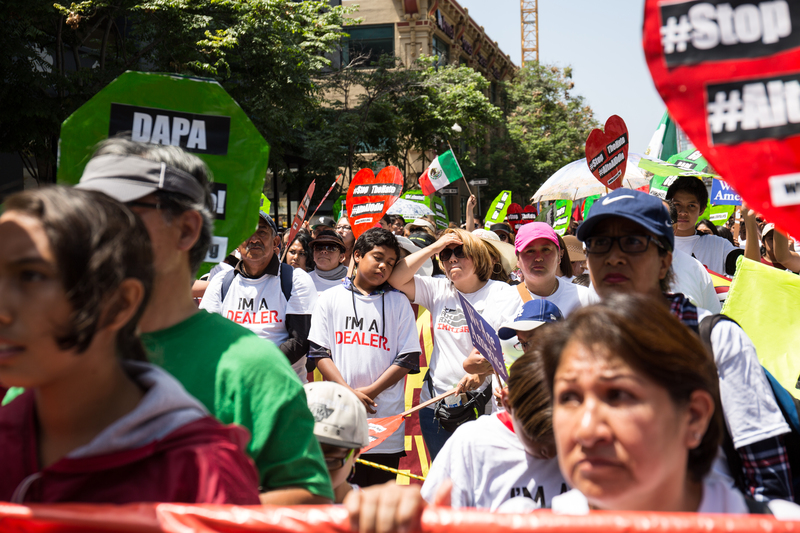 Protesters hold up signs that supporting DAPA or the Deferred Action for Parents of Americans and Lawful Permanent Residents. 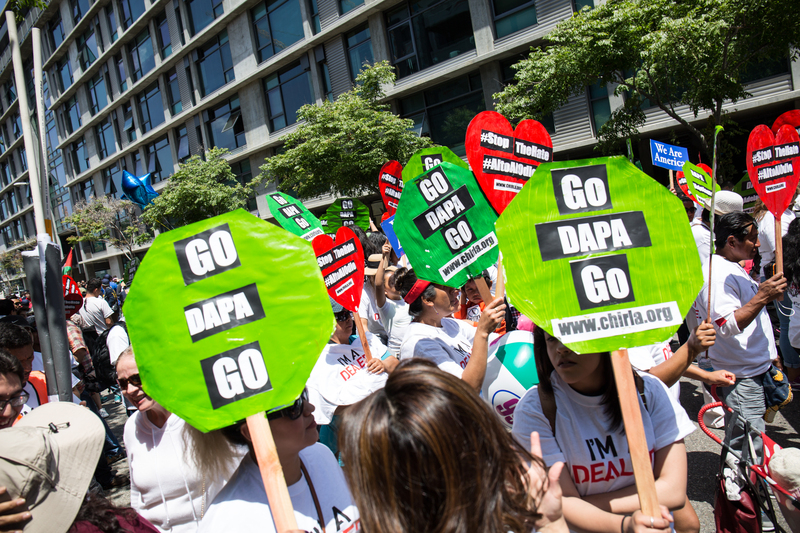 The Supreme Court is deciding on wether to repeal it or not. 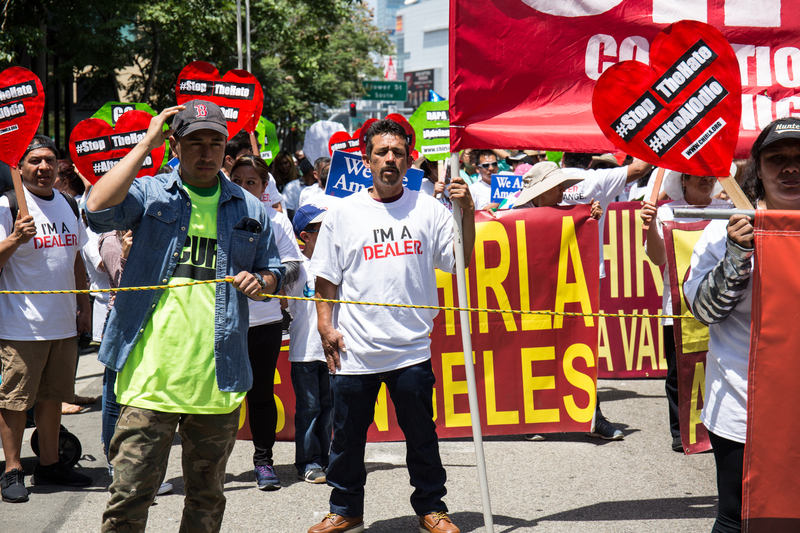 A man wears a shirt that reads I am a dealer, referring to Donald Trump’s comments on Mexican immigrants. 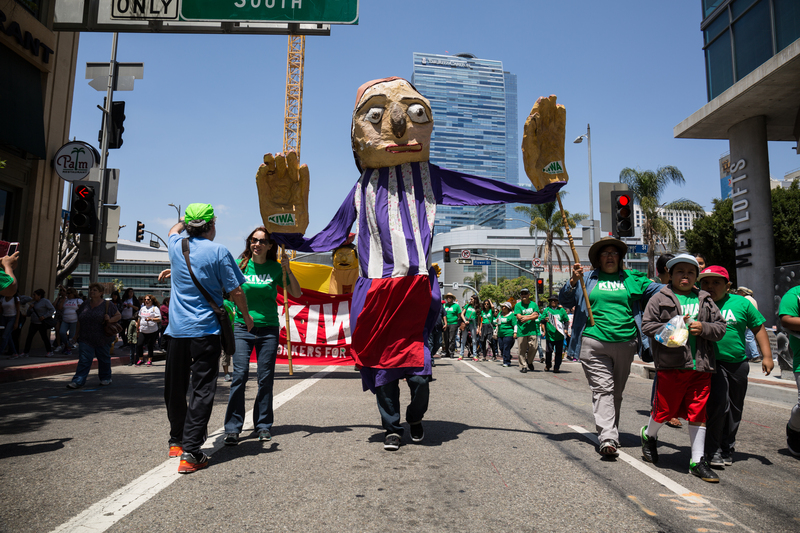 The crowd at the International Workers’ Day march in Downtown Los Angeles, CA. 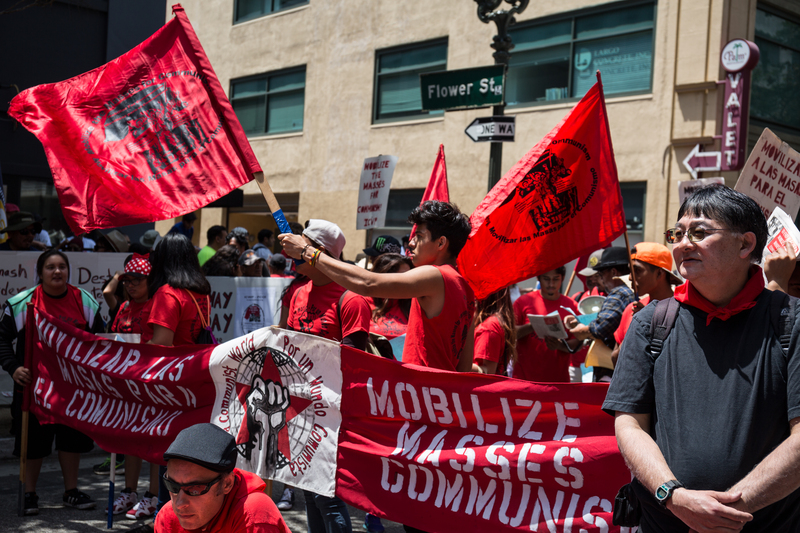 A communist group waves red flags waiting for the march to start. 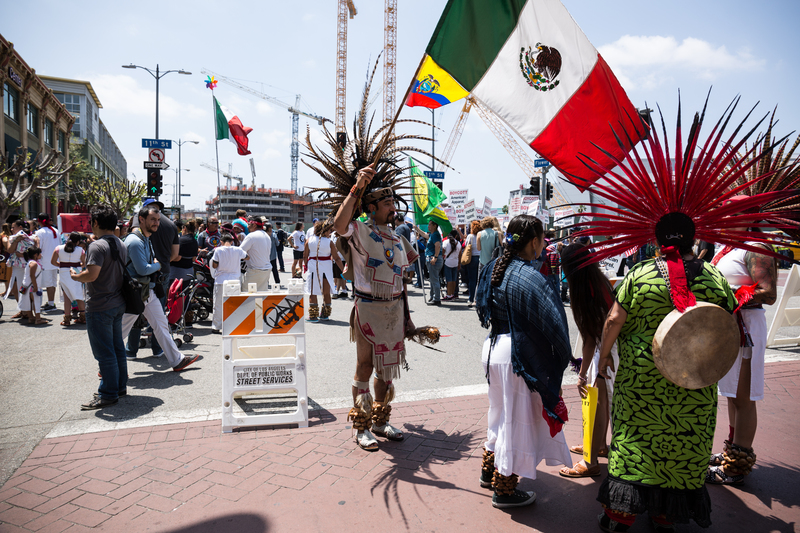 A protester representing indigenous people waves a Mexican flag before the march starts. A boy rests his head waiting for the International Workers’ Day march to begin. 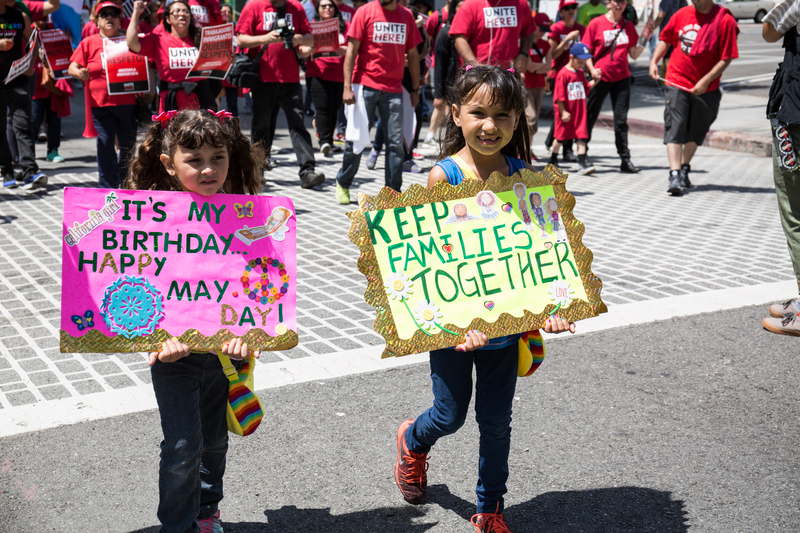 Two kids with signs march with protesters for International Workers’ Day in Downtown Los Angeles. 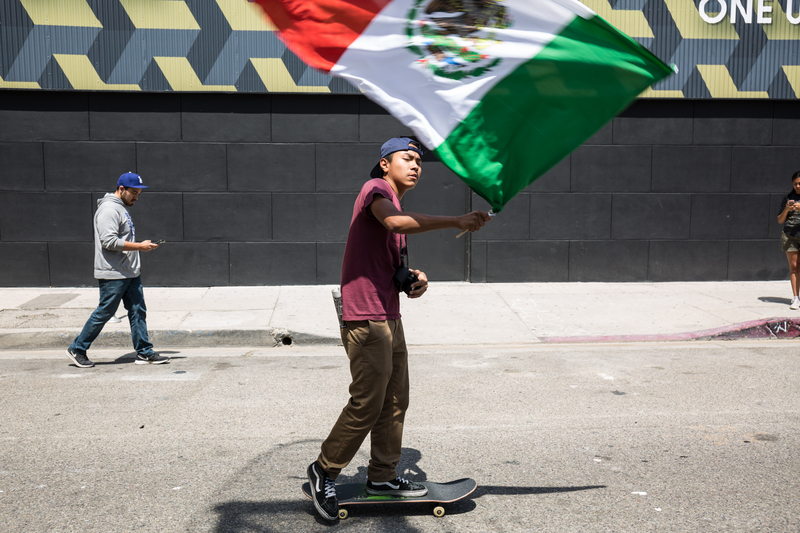 A man flies a Mexican flag while skateboarding in the march in Downtown Los Angeles. 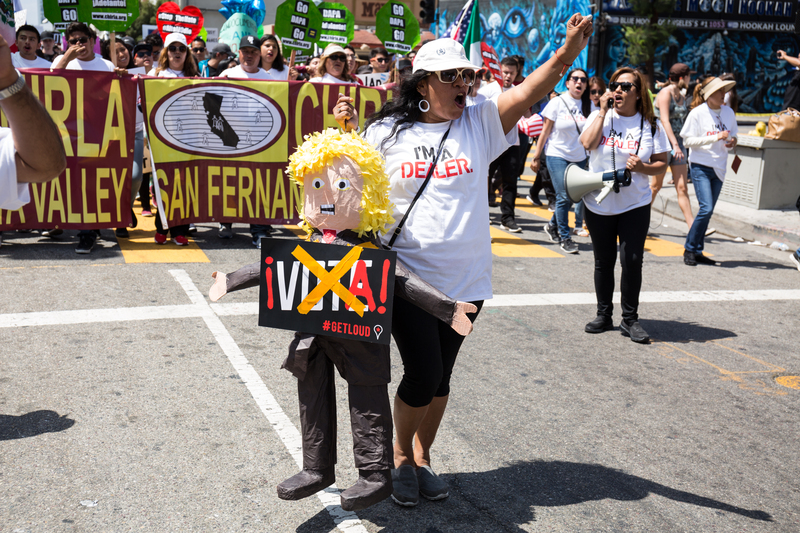 A woman carries a Donald Trump piñata in the International Workers’ Day march. The group Unite Here! 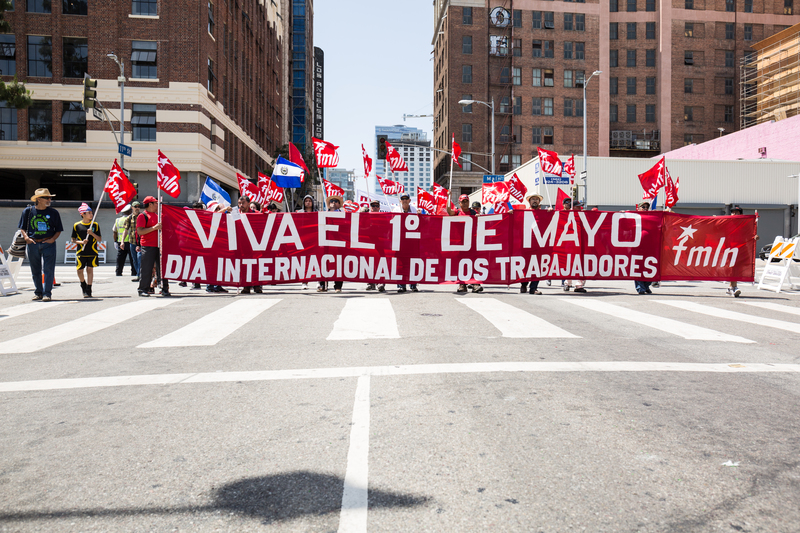 marches in Downtown Los Angeles for International Workers’ Day. 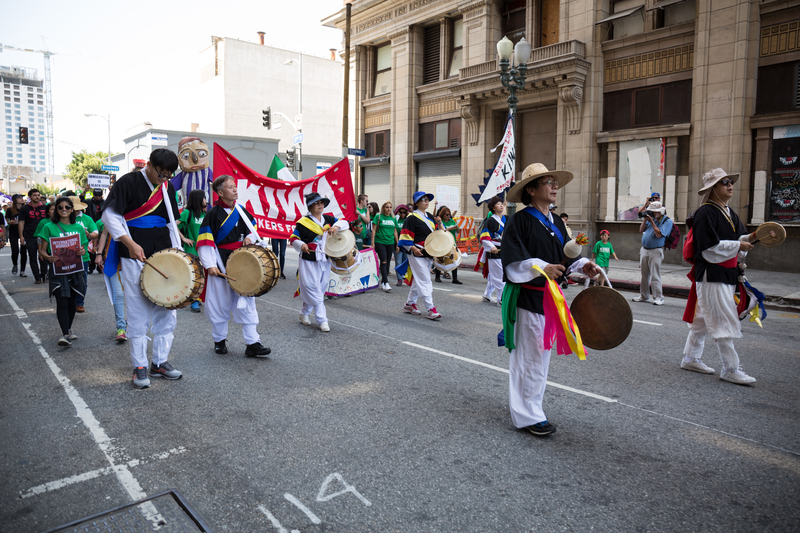 Musicians from KIWA wear traditional dress and march. 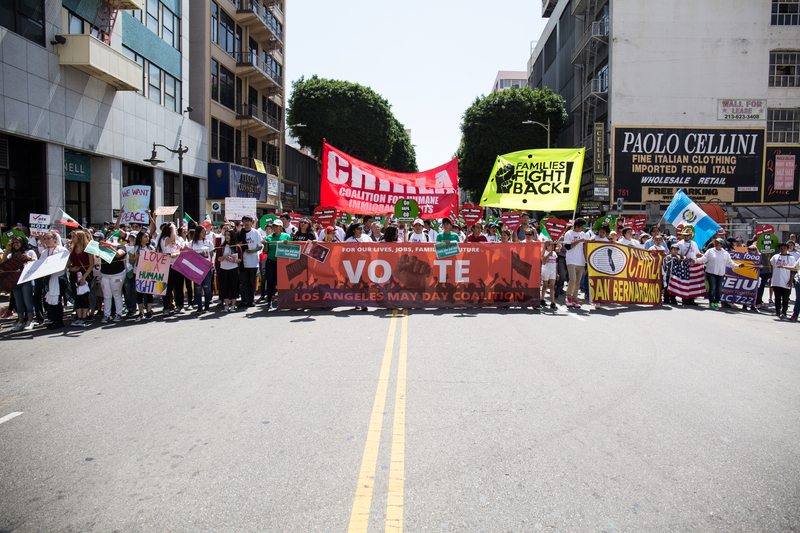 Members of the Farabundo Martí National Liberation Front of Los Angeles march behind a banner in the International Workers’day march. 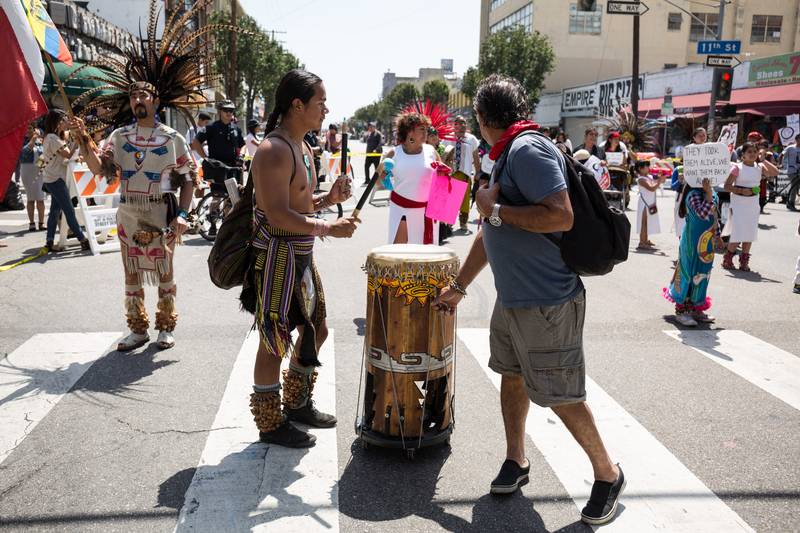 A protester representing indigenous people plays a drum during the march. 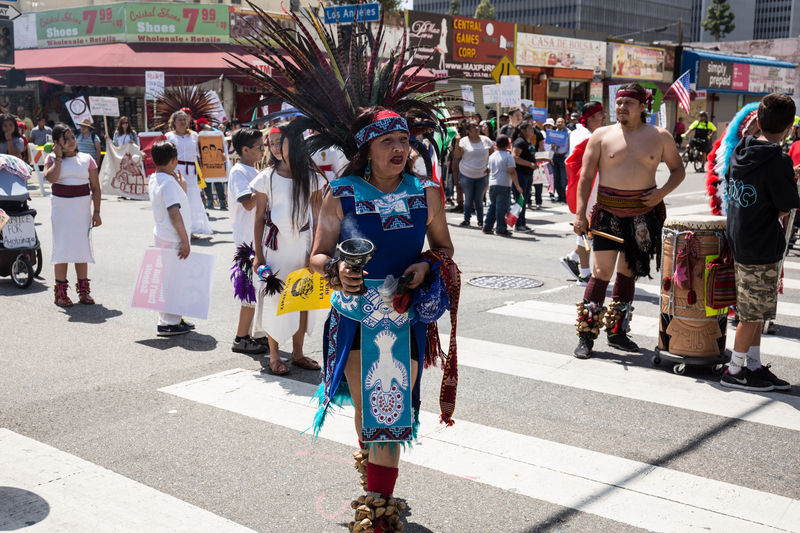 A protester representing indigenous people in traditional dress marches for International Workers’ Day. 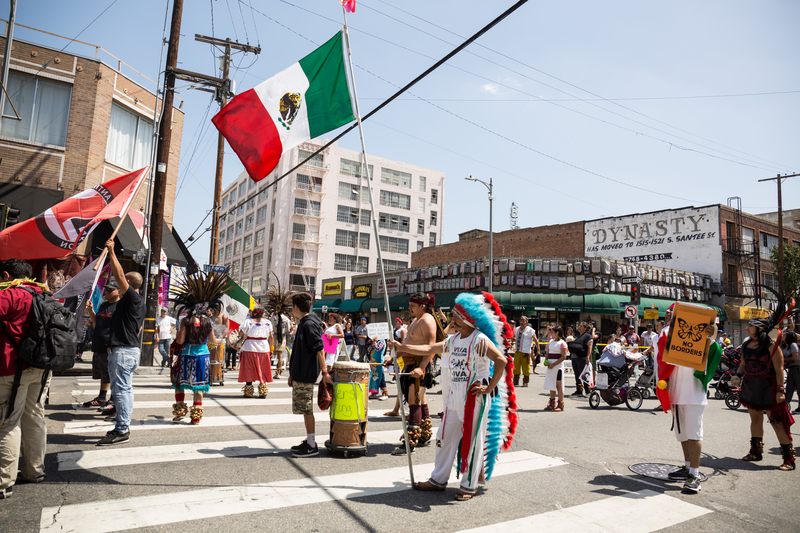 A protester representing indigenous people holds up a Mexican flag during the march. 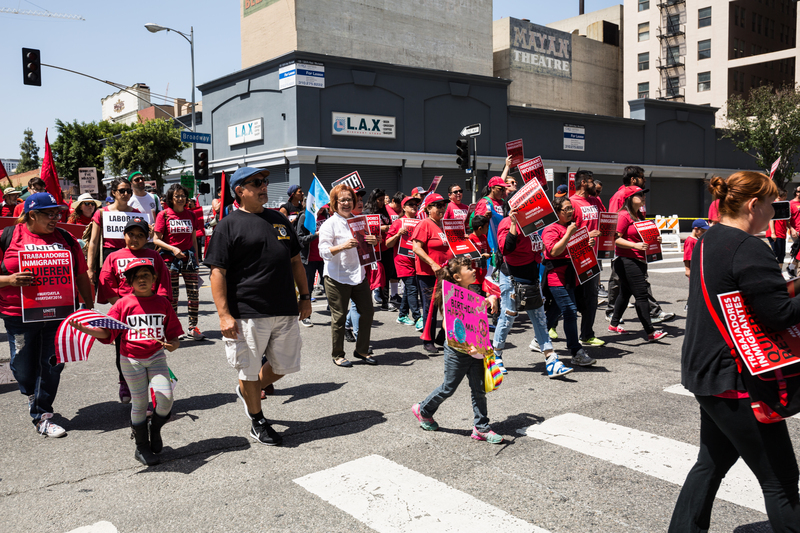 The front of the International Workers’ Day march. 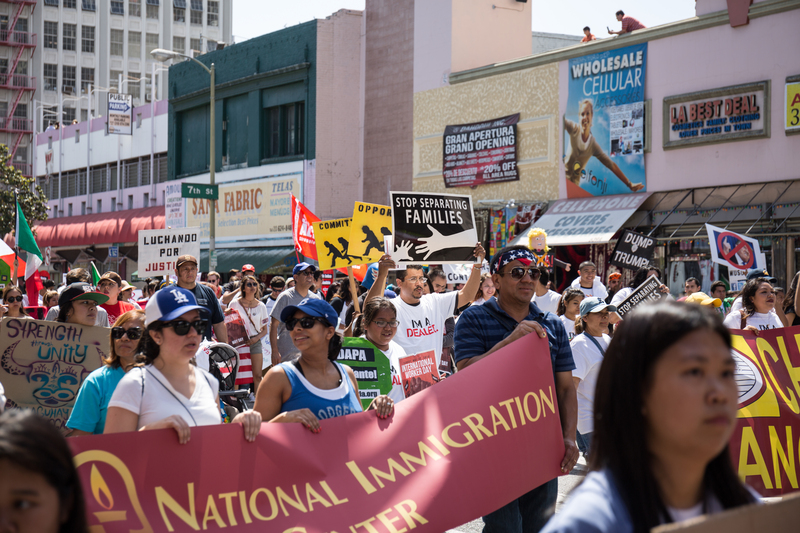 Pro immigration protesters hold signs in the International Workers’ Day march. 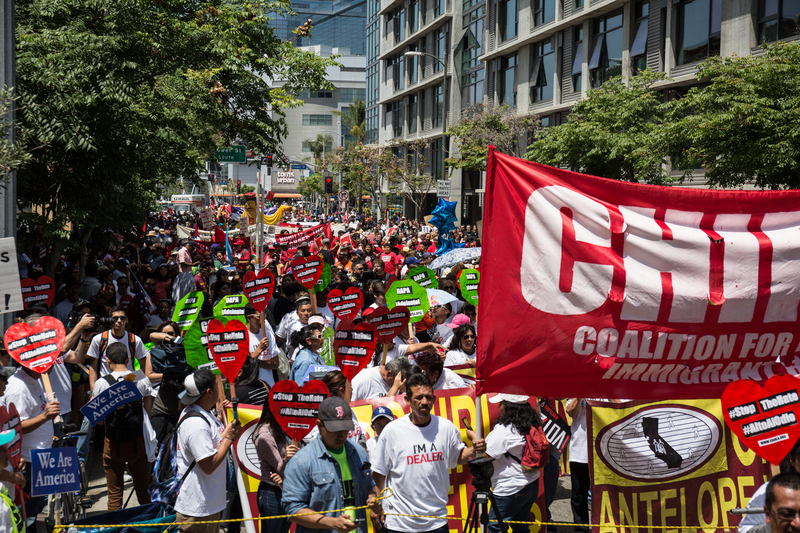 Protesters waving American and Mexican flags in the International Workers’ Day march. 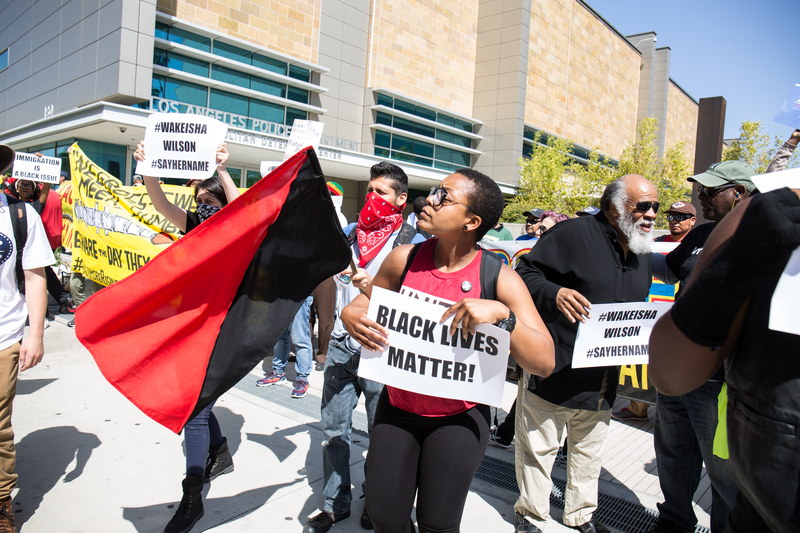 The march stops at the Los Angeles Metropolitan Detention Center where members of Black Lives Matter speak about Wakisha Wilson who died in the center. 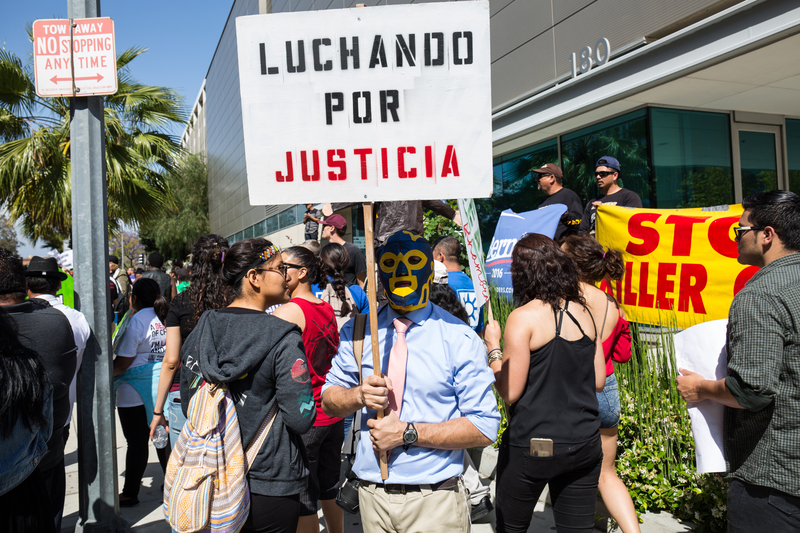 A protester wears a luchador mask at the Los Angeles Metropolitan Detention Center while the march is stopped. 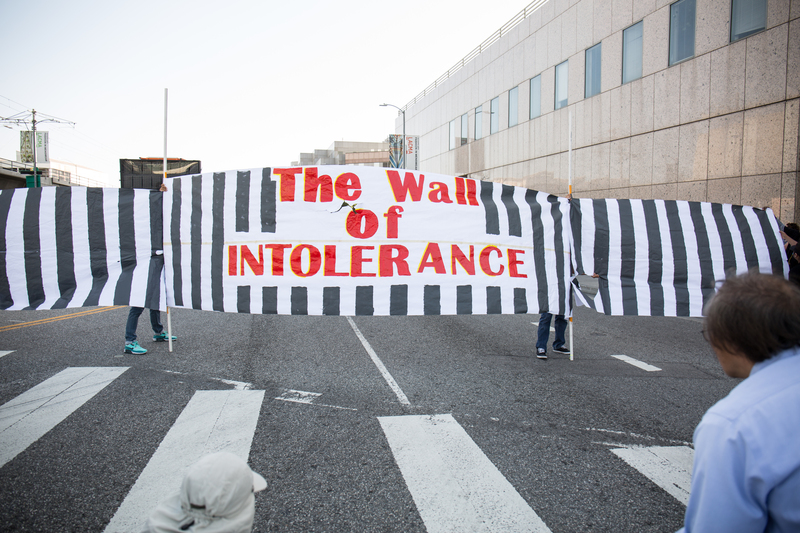 A large banner made of paper that represents the United States and Mexico border fence that says The Wall of Intolerance stops the march in front of the Metropolitan Detention Center in Downtown Los Angeles. 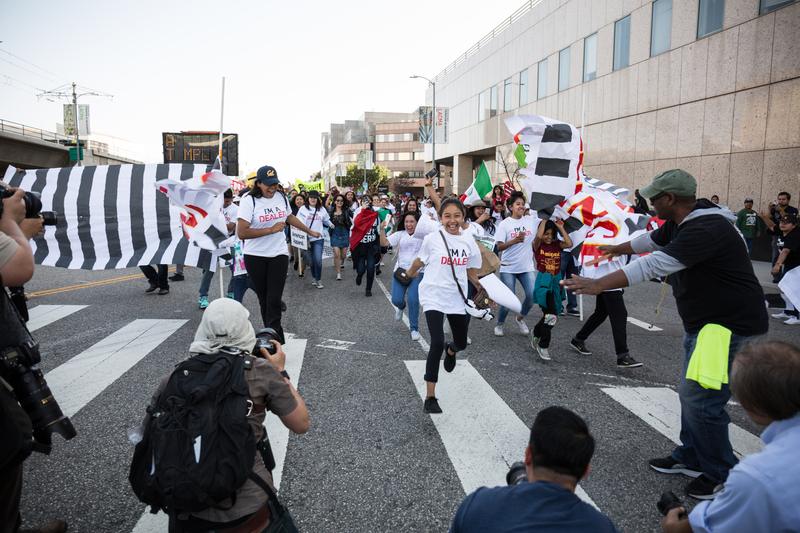 Children run through the banner representing the United States and Mexico border fence in front of the Metropolitan Detention Center in Downtown Los Angeles. 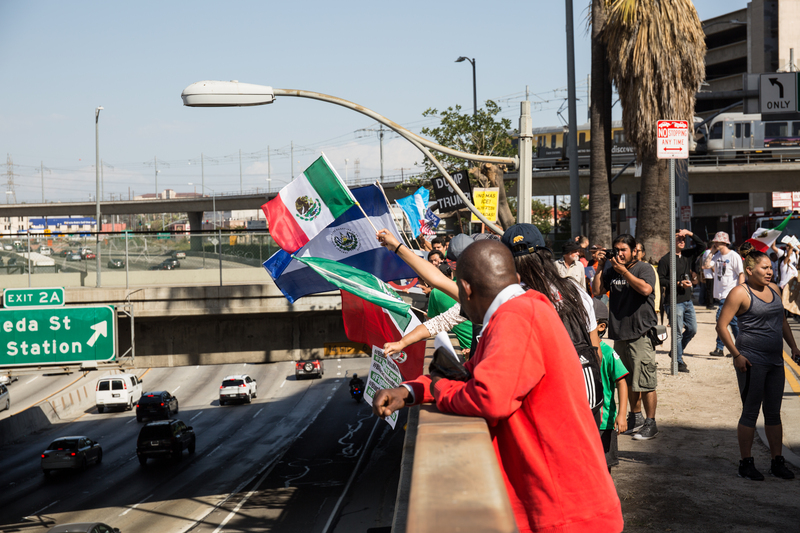 Protesters hold flags and banners over a freeway at the end of the march route.